Each year when my brother and I were growing up, my mom would hang our stockings on the mantle. She had two stockings made for us with our names sewn on in a fancy stitch. They were made a very long time ago, so this kind of specialty work was very precious and not found in every store or mail order magazine as it is today. Those stockings always represented to me my parents’ love for us. Even though they did not have a lot in the way of finances when we were young, they always made sure we never felt lacking. We didn’t have a lot of things but we thought we did and it was our parents’ love that made the ordinary seem extraordinary. As my brother and I got older and had our own families, I forgot about the stockings. My new stockings for my husband and our kids (from his first marriage) took priority. When our little boy Jeffrey came, I made sure he had his stocking with his name on it. My mom’s tradition of those special stockings continued and now each grandchild has their special stocking, too. About ten years ago, I had a surprising Christmas experience. As Christmas day arrived, I was busy making sure everything was perfect before Jeffrey walked in for Santa’s morning surprise. But, when I walked into the living room, what should I see on the mantle of the fireplace, but my stocking from when I was a little girl! My heart leaped with delight and my eyes filled with tears. My logical mind wanted to figure out how it had gotten there and who had brought it, but those thoughts were quickly transcended for a moment by the real message of that stocking … I was loved. 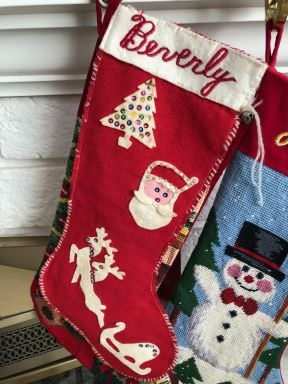 I was loved not just by my parents, my child, my husband, or my brother who had found the stocking and gave it to my husband to hang. I was just loved. And, I was love. I was connected to something greater than myself. I was connected to every living thing . . . I was connected to God, and nothing could stop that connection . . . not distance, not attitudes, and not death. There was something greater at work in my life and that stocking reminded me of that. Whenever life seems to be sad, hurtful, depressing, or anxious, God is still at work, and He loves me . . . He loves all of us. That special stocking was the instrument that reminded me of God’s Love. Even, if just for a moment. And, that moment was enough for God to get past my “sophisticated” ego mind and connect me with His Love. Maybe you haven’t had a “special stocking” appear on your mantle this year (or maybe you just haven’t noticed it! ), but you can still remember you are loved. After all, isn’t that really the message of the Christmas season: to remember the birth of love? Perhaps you can help someone in need remember they are loved by a phone call, a card, or simply a loving prayer. The “special stocking” of love you extend to another will be the blessing you receive; and perhaps just the little willingness that God needs to get past your “logical” ego mind and connect you with His Love. All of us at Miracle Distribution Center join together in extending to you our love, thanks, and blessings for a miraculous holiday season.